Blurb Description: Wilhelmina has a hundred identities. 2) To Write a Comprehensive Review for it BECAUSE IT IS AWESOME. At this point it seems like I’ve also succeeded in breaking my heart yet again. I’m halfway through my FIRST read of The Mirror King (57% according to Goodreads. WHAT.) AND. UM. WELL. I’m just reading and reading and reading and not at all processing because that’s what I do with good books and wait for everything bad to hit me after. YOU, HOWEVER, ARE HERE FOR The Orphan Queen, SO WELCOME. 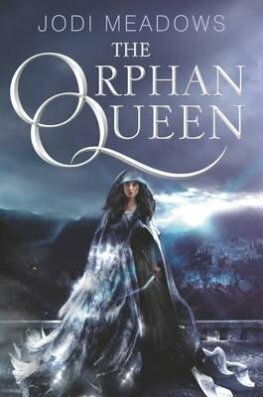 What is The Orphan Queen? Oh, it is only the book that will get you SO BLOODY ADDICTED you’ll need to have The Mirror King to open and devour right away. Wilhelmina is a spy in the palace in the Indigo Kingdom. She’s the long lost princess of the Aecor Kingdom that stole her homeland and slaughtered her parents. Wilhelmina HAS MAGIC (which is illegal, just so you know). And now, almost ten years later, IT IS TIME TO EXACT REVENGE AND SAVE HER HOMELAND. Except in politics, sly games and vigilantism NOTHING IS BLACK AND WHITE. Especially a young queen’s feelings, and her magic. Wil is, as I was told, A BADASS HEROINE! What makes her stand out SO MUCH in my head though is that the fact that she’s NOT ALWAYS RIGHT. Or holier than thou. Or anything of the sort. She’s scared, she makes mistakes, she pays for her mistakes and she’s ALSO BRILLIANT. She just seemed an all-around REAL character with her fear and insecurities and everything. I love Wil. Another aspect I ADORE about TOQ is the Osperys (yes, even controlling Patrick) and the fact that they could just get things done. THERE WAS NO WAITING ABOUT IN THEIR MISSIONS, nothing less than true grief when they lost one of their own for they are family and all understanding all the time about who the other person is. I did love that there wasn’t a lot of importance given to court drama and social niceties because well, that happens in EVERY book and it would’ve just dragged this piece of gorgeous literature on. I think the ONLY thing I didn’t like (in my first read) is the fact that I predicted a certain reveal about a certain character and it was kind of disappointing because I was hoping I wasn’t right. All in all, A BEAUTIFUL BOOK THAT YOU SHOULD ALREADY BE READING. If you had a group of fictional rebels, who would you choose to be in that group? Have you read this series? What did YOU think? Should I be reading the novellas?